Twenty years ago—man, that makes me sound old—I served as a Journeyman Missionary with what was then the Foreign Mission Board and is now imbConnecting outside Johannesburg, South Africa. 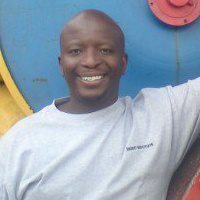 I worked in Soweto near daily doing relief work, church planting, theological education, and my primary role as a regional youth worker assisting our Baptist churches around Joburg. At my first youth rallies I met Aaron Maselwane (pictured here). Yes, the name helped, but there it more to it. Gregarious, talented, intelligent and articulate, Aaron is a leader by nature. Just over ten years ago he came to the states in a singing group. My family had the pleasure of hosting him then. And since the explosion of Facebook we've reconnected therein. Enduring friendships with brothers in Christ bring such joy. When I needed to recall the lyrics of South African Gospel song for a writing project this week, I thought, "I'll message Aaron." Yesterday afternoon he wrote back. I noticed he was online right then and wrote, "Hey, you're online now!" He shot back, "Yes I am. We could even Skype for posterity of the music." So we did. Aaron and I both observed the wonder of it. All the time and space between us and here we were. He on his desktop PC outside Joburg. Me on my MacBook Pro in Nebraska. We talked about life, work, friends, and family. We squeezed a lot in until we lost connection. He had warned that might happen on his end. It was a joy! And throughout it it we expressed the wonder of it. The wonder of technology. The wonder of friendship. The wonder of unity in Christ. The wonder of it all. It got me to thinking. We both needed computers and high speed internet to have that conversation and it worked best when we were both awake given the time difference. Yet I can pray anytime, anywhere, about anything. No special equipment. No time difference. No concern for losing the connection on the other end. Our God is faithful. He calls us to pray. Make the connection. Live in the wonder of it.